In Defenders of Ulthuan and Sons of Ellyrion, Ulthuan comes under attack from an alliance of the traitorous dark elves and Chaos-corrupted Norscans. As the great heroes of the high elves – Tyrion, Teclis and Eltharion among them – rally their armies, the fate of the land lies in the hands of Eldain and Caelir, brothers separated by fate and treachery. In Guardians of the Forest, the noble Bretonnian knight Leofric is thrown into an uneasy alliance with the wood elves as they battle a plot by monstrous beastmen to corrupt the sacred groves of Athel Loren and threatens not only the forest, but all of Bretonnia. What is it about elves that keeps writers coming back to them? Is it their beauty and sheer otherworldliness or the fact that their skills that are so far beyond anything a human could manage? Is it the fact that they possess knowledge spanning millennia? Or is it just that they look cool with a bow and arrow? For me, it was all those things. Elves have been a staple of fantasy fiction for many years now, even before Professor Tolkien more or less defined them for the modern readership of fantasy fiction. Of course elves have existed in various forms in fiction throughout the history of storytelling, from the elves of Lord Dunsanay, through various Celtic incarnations of the Sidhe and Germanic mythology all the way back to the Old Norse tradition of the Eddur. They’ve been an enduring element of fantasy for a decades and have changed many times from supernatural creatures of, more or less, positive aspect to troublesome beings of malicious pranks and mischief-making and back again. I think this is what makes elves so interesting to write, as they have a rich pedigree of mythology to draw upon. Tolkien’s work set the template for elves for a long time, and casts a large shadow under which elves in fantasy fiction can either bask or be rendered down to cheap imitations. What I love about Warhammer elves is that they draw from all these varied aspects of elf mythology. They have their cake and eat it in many respects. Favoured children of the gods, they have the knowledge and poise of divine beings, but are wilful, capricious and capable of dark and bloody acts of violence. And that’s just the ones we think of as the ‘good’ elves. In the years before I came to write Guardians of the Forest, I’d had no interest in writing about them. 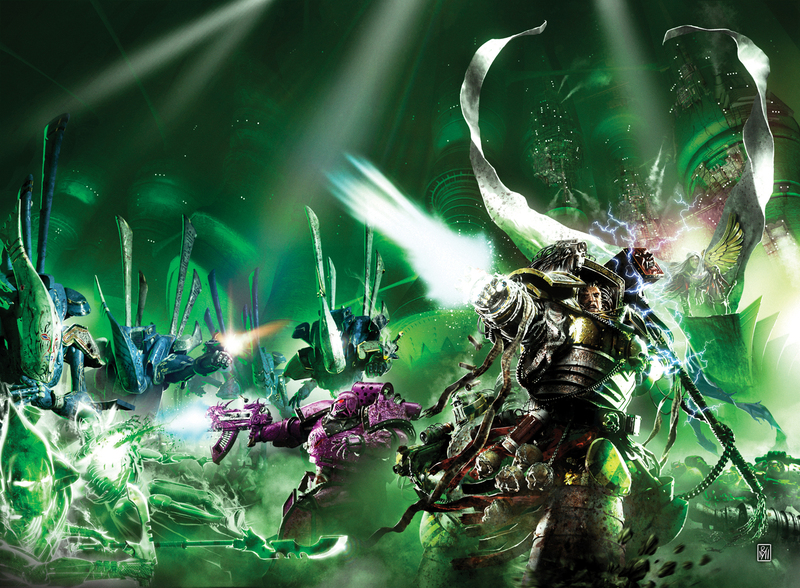 They didn’t interest me as a race and their background didn’t have the jagged edges that attracted me to other races of the Warhammer World. That all changed when the Design Studio started work on the new Wood Elf book and I saw what the guys next to me were doing with the artwork, background and models. I was hooked by the darker imagery, the spikier personality of the elves and the more threatening vibe they had. The more I heard and saw of this emerging book, the more I saw the Wood Elves taking on the darker quality of old elves, I knew I wanted to tell a story of them. Guardians of the Forest is a book that shows the magical nature of the elves, but to really highlight that aspect, it needed a human viewpoint character to experience that, hence the inclusion of the Bretonnian knight, Leofric Carrard. He would be the reader’s eyes and ears in this place of wondrous magic and sudden cruelty, where an intruder’s life hung on a slender thread of life or death. I always intended to go back and tell more stories of the inhabitants of Athel Loren, but never quite got round to it (though I did tell a tale of Leofric’s further adventures in Freedom’s Home or Glory’s Grave). Instead, I turned to the High Elves, thinking that, if I could be surprised and reawakened to the potential for cool stories about the Wood Elves, then surely the same would be true of the High Elves. I didn’t much like the High Elves either, as they seemed to be without the grittiness of the revitalised Wood Elves, but when I re-read their original background I saw a culture that was deeply divided and tragically flawed; fertile ground for exciting tales. The first piece I wrote was Kinstrife, a short story for The Cold Hand of Betrayal anthology. Like a lot of my stories, it was planned as a one-off, but as it told itself, it became clear there was great milage to be had with Caelir, Eldain and Rhianna. From the seeds sown in that story came the plot of Defenders of Ulthuan and Sons of Ellyrion, a two-parter that describes a terrifying invasion of Ulthuan by the Dark Elves of Naggaroth. Defenders came out several years before I got the chance to write Sons, but it took no time at all to get back into the mindset of the two brothers and the war their conflict had helped unleash. I think the writing Sons of Ellyrion was the most fun I’ve ever had with a novel, as it had a scope and scale that shifted from the mighty events shaping the future of Ulthuan to the intimate events between two brothers with a gulf of betrayal between them. And given that it deals with a massive invasion of Dark Elves, it allowed me to play with some of the mightiest elven heroes; Tyrion, Teclis, the Everqueen, Finubar and, most fun of all – Eltharion the Grim. Eltharion quickly emerged as my favourite of the High Elf characters to write. So much so that I decided to tell a story for the 2011 Black Library Live chapbook about him. That story, Deathmasque, is one that explores a moment in Eltharion’s life where he sees that there’s a choice between remaining mired in despair or embracing the possibility of hope. What choice he makes will, I hope, be a story for a future time. Of course, there’s one glaring omission from this omnibus of Elves, and that’s a novel about the Dark Elves. Now, I absolutely love the Dark Elf background, the horror, the bloody intrigue and their scheming, murderous evil, so why didn’t I write a book about them? Two words. Malus Darkblade. Dan Abnett and Mike Lee did such a great job with those stories, that I didn’t feel there was a need to write more about them. But there’s been a few years since those books were written.